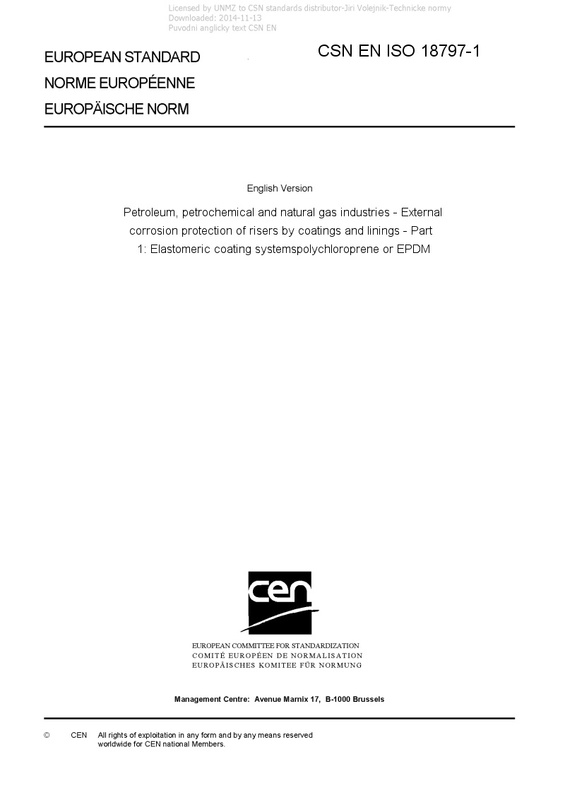 EN ISO 18797-1 Petroleum, petrochemical and natural gas industries - External corrosion protection of risers by coatings and linings - Part 1: Elastomeric coating systemspolychloroprene or EPDM - ISO 18797-1:2016 specifies the minimum requirements for materials selection, surface preparation, application, inspection, testing, qualification and acceptance criteria of external coating for steel risers pipes used in the splash zone, their field joints and clamps/guides, using an elastomeric protective coating based on polychloroprene, EPDM or equivalent. This is applicable for new construction and repair of applied pipes before installation. Maintenance requirements and field repairs are covered in ISO 18797-2. ISO 18797-1:2016 also specifies the requirements for transportation, handling and storage of riser pipes before and after surface preparation and coating application.